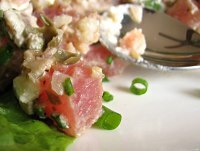 Hats off: Tuna and Goat Cheese Tartare. Let’s say you’re a woman who never wears hats. One day you spot an outrageously stylish hat, the kind of hat Hollywood startlets from the forties wore when they put their handprints in that sidewalk wherever it is where they do the handprint thing while flashbulbs popped and adoring fans cried at how fabulous they looked in the hat. You buy the hat forgetting that your normal daily wear is ripped jeans and a faded t-shirt you bought from The Onion ten years ago. As soon as you see yourself in the mirror in this hat it hits you: You have no business wearing this hat, anything like this hat, or anything in the remote family of this hat. You dweeb. Food styling is my fancy hat. My pictures usually end up worse when I mess with the dish too much than when I leave it alone. So I do a minimum of arranging, focus on the natural state of the food, and hope one of the shots comes out okay. Besides, I’m hungry, and I don’t feel like eating cold, congealed food (unless it’s pudding). Then I saw this intriguing recipe for Tuna and Goat Cheese Tartare in Anne Willan’s Good Food No Fuss and tried the damned hat on again. Willan describes this dish, a creation of Australian Chef Tetsuya Wakuda, as a combination of Asian and Western flavors “to brilliant effect.” I had a vision—food styling! 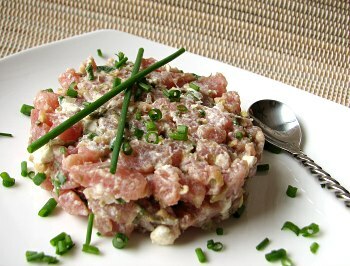 presentation!—of the tartar molded with a criss-cross of chives on top. In my head, the smooth disk of tartare had distinct red tuna and alabaster squares of goat cheese. On the plate, the disk ended up ragged, the tuna paled to pink, and the goat cheese dissolved into white smears. If my family had been around, they would have started making fun of me around the third time I picked up the chives, wiped them off, then repositioned them. Then they would have called me a dweeb or its Korean equivalent. Babo (바보), maybe. But never mind my herb-arrangement skills. The tartare is rich from the tuna and cheese, almost too rich. It would be great served alongside warm grilled fruit like pineapple or melon to counter the richness and provide a temperature contrast. A squeeze of orange juice in the dressing might be a good touch too. I spooned it on romaine leaves with a side of crusty bread. Endives or sesame crackers would go just as well. Sata, or Grilled fish & coconut in banana leaves, or Admit it, you’ve always wanted to put fish in a blender. A friend in the market for a new computer e-mailed to inquire about technical specifications on SATA hard drives and new types of RAM. I did some research and sent her my findings along with this fact: “According to Wikipedia, SATA is ‘a traditional dish from the Malaysian state of Terengganu, consisting of spiced fish meat wrapped in banana leaves and cooked on a grill. '” While this information did nothing to help her choose a new computer we both agreed that 1) it sounded delicious, 2) I should make it as soon as possible, and 3) I had to blog about it because 4) nothing could be more geeky than making a food because it has the same name as a type of hard drive. “Now I just need a recipe, some fish, seasonings, banana leaves, and a grill,” I wrote. “How hard could it be? I mean, Terengganuans do it all the time, right?” Well aside from my one advantage (tradition wouldn’t keep me from using a food processor instead of pounding the fish), it was hard for at least five reasons. 1) Google was supposed to gush a waterfall of recipes in English. It didn’t. Fortunately, Malaysian food blog masak-masak provided a great recipe along with some background on this popular regional street food. Please visit her post on sata. 2) Banana trees do not conveniently drop their leaves all over Illinois for your sata. My Asian grocer sold me a package of frozen banana leaves that Terengganuans would likely mock me for using were I not positive that my Terengganuan readership is very low. 3) Illinois is not surrounded by fertile seas yielding fresh mackerel. If sata featured corn wrapped in banana leaves and grilled I would have been so set. Mackerel is so perishable that it never appears in my town. Even frozen mackerel requires a special trek to Chicago. As it turned out, my local fishmonger special ordered five pounds of fresh mackerel just for me. I didn’t know I could do that. Sata taught me something! 4) Turmeric leaf? Turmeric leaf? I didn’t even try. Finding fresh turmeric is nearly impossible; finding turmeric leaf requires a genie. No way I was driving three hours to Chicago to comb Malaysian neighborhoods and Devon Avenue in search of a leaf. If I ever find fresh turmeric I will plant it and hope for leaves. Until then, I’m sorry Terengganu, but there will be no turmeric leaf in my sata. 5) When I ordered my mackerel it was a balmy 65 degrees. By the time I made the sata yesterday the temperature dropped to 30 with a wind chill of 8. I tried to go for a walk and turned back when I couldn’t feel my face. Do Terengganuans risk frostbite for sata? Probably not. Yet somehow I did it, I made sata. I chose to go with the square packets pictured in this Malaysia Best article instead of cones so that the fish would cook more evenly, the folding would be easier, and I wouldn’t have to skewer anything. While sticks do make food more fun I felt I’d already expended an awful lot of effort on this project. Pureeing the raw fish, a new experience, encouraged me to consider the merits of vegetarianism. That stopped when the coconutty charred banana fragrance hit my nose and the spicy chilies did their usual tongue dance. Sata is good! I’m sure it can’t compare to the local treat but it delighted me nonetheless. I hope to find a turmeric leaf so that I can make it properly one day. Despite the title of this post I don’t recommend a blender for this very thick mixture, but if that’s all you have, go for it. A food processor will make life much easier. I left the skin on because that’s where most of the precious omega-3 fatty acids are; you really don’t notice the skin once it’s blended and grilled. If you choose to go skinless, weigh the fish without the skin. There are high mercury level warnings on king mackerel so I would avoid that variety in favor of the more common smaller varieties. The folding instructions are neither rocket science nor set in stone; consider them guidance. 1) Preheat your grill to medium. Rinse your banana leaves well; you don’t know where they’ve been. Cut out about 8 rectangles roughly 8 by 10 inches. If your leaves are smaller or larger you can make smaller or larger parcels, don’t worry about it. Set aside. 2) Roughly chop the shallots, garlic, ginger, and turmeric leaf and pulse in a food processor along with the salt, sugar, and ground chilies. Pulse until the ingredients are minced and no chunks remain. 3) Add the fish and process until meat is almost completely pureed. Add coconut and process until mixture is well mixed and pasty, scraping sides as needed. 4) Lay down a banana leaf rectangle. Patch any cracks by laying spare strips of banana leaf over them. Using a disher or a half-cup measure, put about 1/2 cup of the fish mixture in the center of the leaf. Scatter on as many sliced chilies as you’d like (see picture 2 below). Fold one long side over the mixture, then fold the other side to overlap it like a folded business letter (see picture 3 below). Fold the remaining sides in a similar fashion to make a slightly rectangle packet (see picture 4 below; also see * note below). Gently squash the packet to distribute the fish mixture evenly. Set aside folded side down. Repeat with the rest of the leaves. You should have eight packets, more or less. 5) Brush packets with a little oil or spray them with cooking spray (optional, but I liked the insurance). Grill folded side down over a medium heat for 5-7 minutes. Flip and grill 5-7 minutes more. Leaves may open up a bit. The fat in the fish and the coconut will keep the mixture moist so err on the side of overdone rather than underdone. Eat hot. Sprinkle filling with salt before eating if it needs it. Leftovers reheat in the microwave very well in their convenient packets. * This method produces a packet with many leaf layers on top and only one leaf layer on the bottom. That allows the grill flavor to penetrate the cracks in the banana leaf and in some case through holes that form, hence you see some browning on the filling in the very first picture above. That was an accidental but happy discovery. If you’d prefer a more evenly steamed fish like in the third picture above, flip the packet over before making the second and final pair of folds in order to protect each side of the packet with at least two layers of leaf. More on sata from Di Bawah Rang Ikang Kering. Interesting long parcel style pictured here.